At PLS, we've put in place the programs and processes that ensure that not only is the end product flawless, but that the process by which we arrive there runs smoothly and efficiently. To that end, the first step we take after the awarding of the contract is to set up a pre-construction meeting at which all parties involved in the project are represented. The purpose? To identify roles and responsibilities and to establish lines of communication that will facilitate product development from beginning to end. 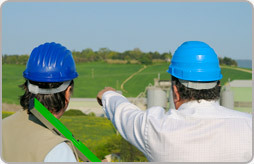 Topics of discussion during this meeting include a review of the site and plans, discussion of the job specs, roles and responsibilities, a review of safety and quality assurance procedures, clarification of any inconsistencies between the project specifications and the our proprietary CQC (Construction Quality Control) program and lastly, identification of testing requirements. PLS CQC requires that all welded seams be tested non-destructively. For HDPE applications, all wedge-welded seams are tested using the air pressure testing method. Extrusion welds are tested utilizing either vacuum testing or spark testing. For reinforced geomembranes, we perform either air lance or vacuum testing. Certain projects, due to PLS CQC procedures, require destructive testing, which involves the strength and bonding testing of random samples taken from site welds. This type of testing measures seam strength and bonding efficiency. While only certain projects demand destructive testing, all projects must undergo a pre-weld test prior to any site welding. This test is performed on trial welds under job site conditions in order to determine and verify seaming conditions, welding equipment functionality and technician proficiency. Upon completion of testing, a Certificate of Acceptance/Completion Certificate is reviewed and approved by the client. All documentation is provided via a PLS post-job pack.